We recommend reaching out to our Support Team at support@freshysites.com to assist in the creation of a new form. We recommend reaching out to our Support Team at support@freshysites.com for any major additions to an existing form. Content edits, and simple additions - Feel free. 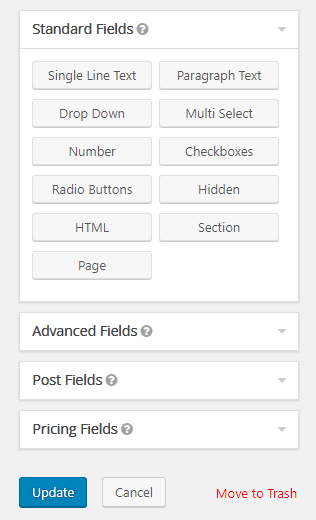 Click and drag fields from the right side to where you want them in the form. Update after edits are made! Email Notification Edits: Who the form submission is sent to. Update email. Adding more than one? Separate emails with a comma.